After a suspenseful wait for this figure, it finally arrived into my grubby hands. 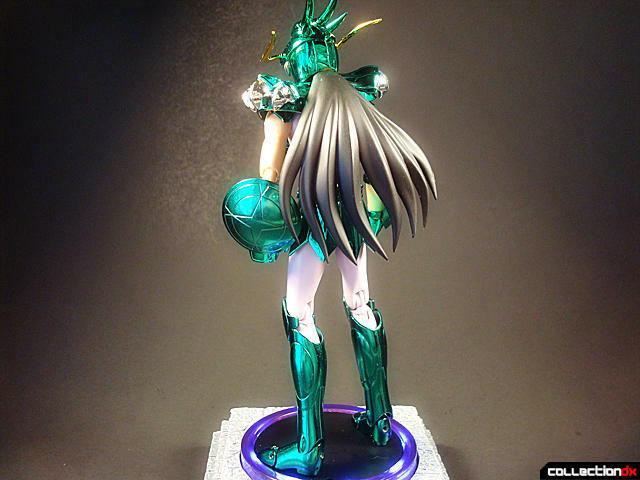 Being my first Saint Cloth Myth figure, it was a very exciting experience. I had always read other reviews and enjoyed most of the designs, but I never made the jump out of fear of having another line to collect. Well, I jumped at the chance of owning one and I am glad I did, especially since this is such a well executed figure. For those of you that already own loads of these figures, you pretty much already know what to expect from this line. 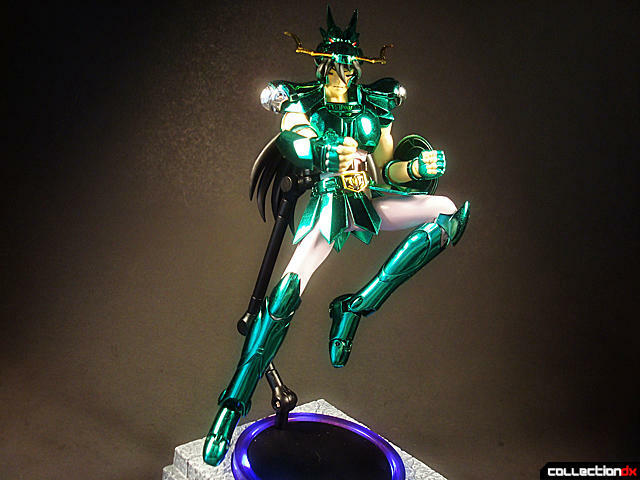 For those of you that are new to this line or are interested in this line, please join me in my Saint Cloth Myth de-virginizing. The box comes in a nice square-ish box that opens up book-style. Each half is the same thickness. One side holds the Object and add-ons and the other side holds the figure and accessories. Both are secured in plastic trays. The included instructions aid in completing the figure correctly. The line diagrams are nicely illustrated with bits of color to help. Making sure the pieces go on the right side of the figure is made easier by matching up the diagrams with the "L" and "R" markings on the corresponding armor pieces. Here is the base figure sans-armor. 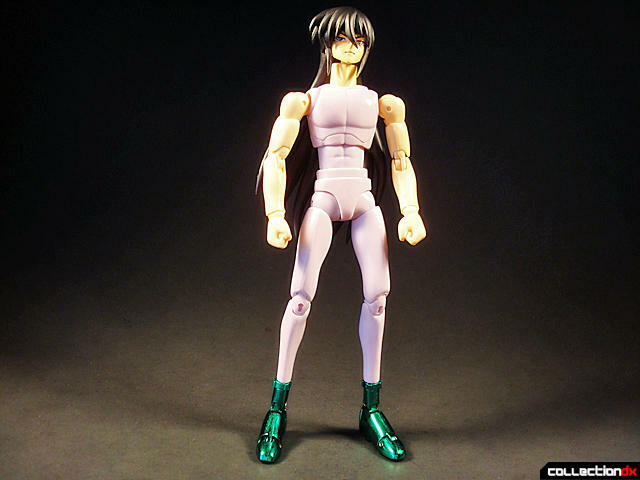 It is immediately apparent how articulated this figure is. Almost every possible part of his body is articulated. Right down to the toes which are attached to nice diecast feet. This is his standard face with open eyes. 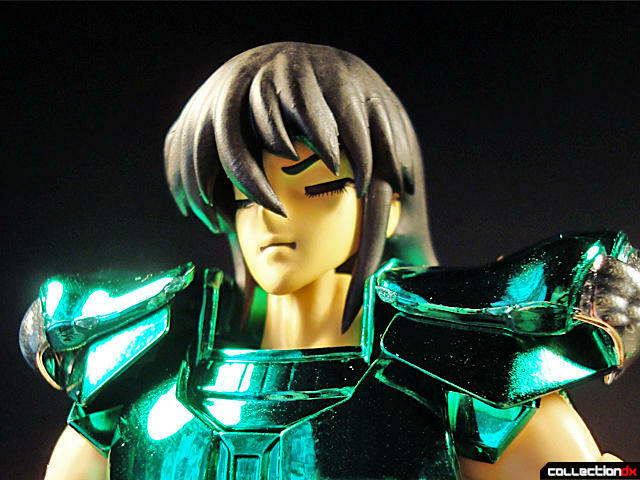 His hair is made up of two well-sculpted pieces of PVC. The fun part comes in when you start putting the armor on the base figure. 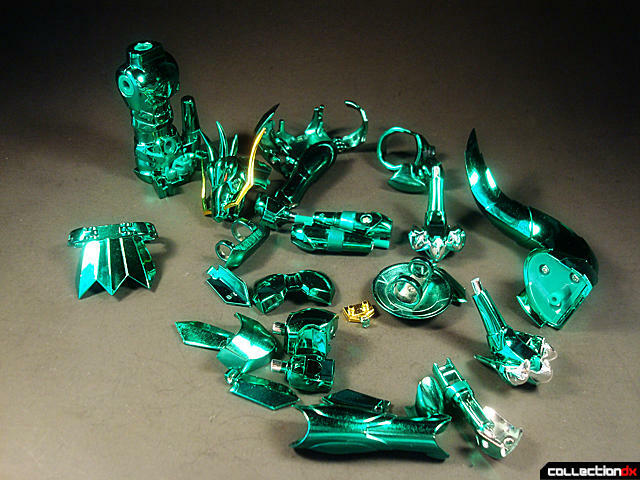 The armor pieces are wonderfully finished in emerald-green chrome. Some pieces are diecast and some are plastic, but the color matches well. The only giveaway as to the material would be the slight texture on the diecast pieces. The theme continues on the back, where everything still looks clean and well done. 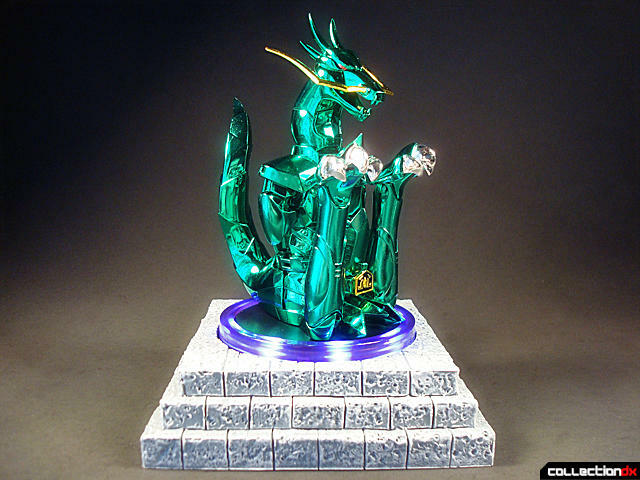 Dragon Shiryu comes with various alternate hands to showcase whatever pose you deem fit for your shelf or display case. Here is one of my favorite poses. So the story goes like this, Dragon Shiryu went up against Perseus Argor, who is equipped with a Medusa Shield that turns everyone to stone when gazed upon. 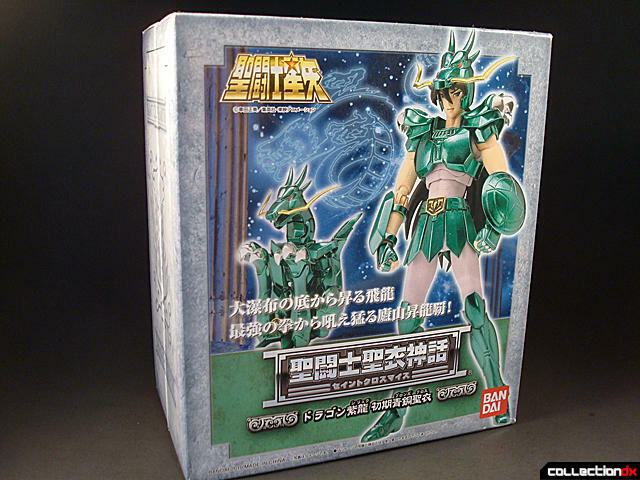 Well, Dragon Shiryu wasn't having this, so he stabbed his own eyes to avoid looking at the Medusa Shield. He went on to defeat Argor and when he raised his Cosmo to the limit, he regained his vision... only to lose it again when Keshura used his chi to blind him. For good this time. If you want to display him blind, this set has you covered. 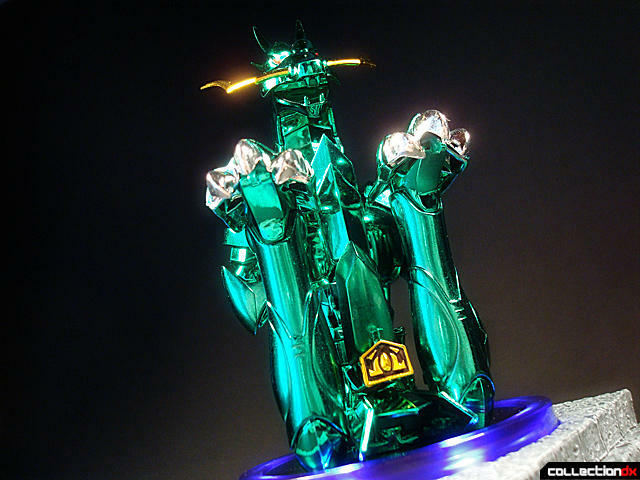 That brings us to Dragon Shiryu's Object, which is... drum roll please, a DRAGON! 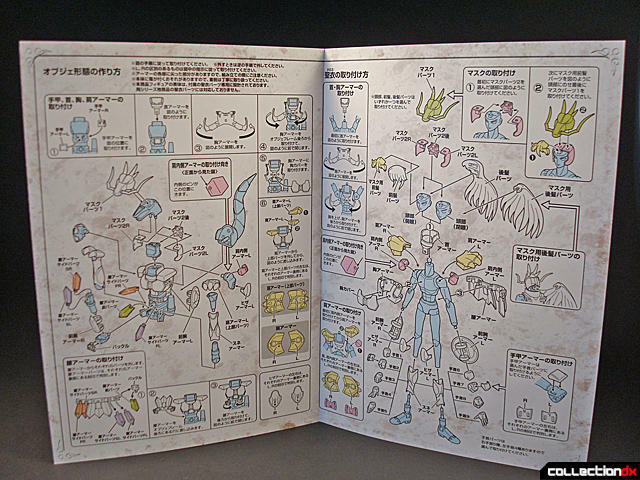 To build his Object, you will need all the various bits of armor and some other included pieces for completion. I have to say, my first time building the Object took me a good 20 minutes, but I loved every minute. Very well done. The finished product is spectacular, like a jewel. I wouldn't mind just displaying this piece alone. The end result has a nice heft due to the use of diecast in the armor. I tried to contain myself since this is my first foray into the world of Saint Cloth Myth (and definitely not my last), but I'm sure we all agree that it is a rather nice piece. Here he is one last time with the Kid's Logic base. im glad you lik it. im somewhat new here posting, but i enter here in a daily basis. anyway, for the review it seens you like a lot this figure. 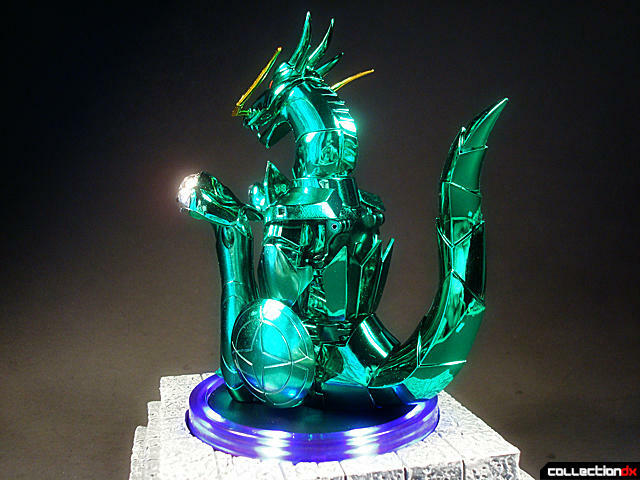 i also collect myth cloth , and believe me, these little jewels are expensive, but worth it every penny. 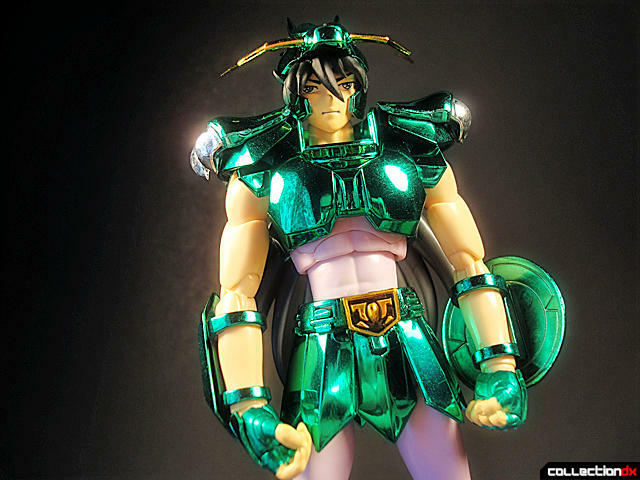 funny thins is, the average collector dont know much about this line, or at least here in usa, but in the rest of the world saint seiya is HUGE. for you know ,the most recently release in asia, is the god of underworld, HADES , give a check out. 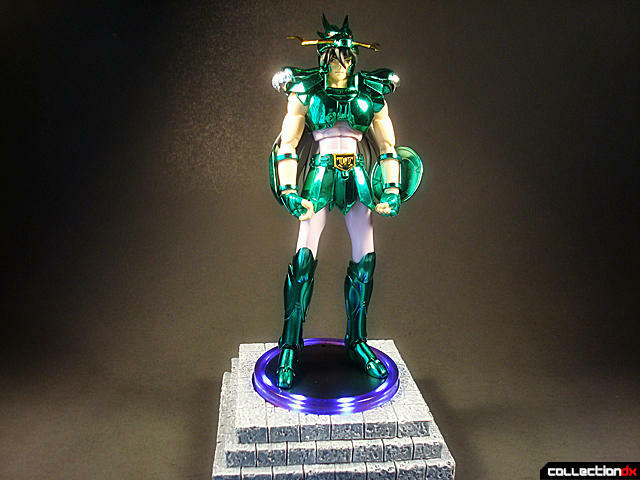 I love collecting Seiya Myths too, but has been taking a long break for the last couple years, but the recent Hades figure got me going again. 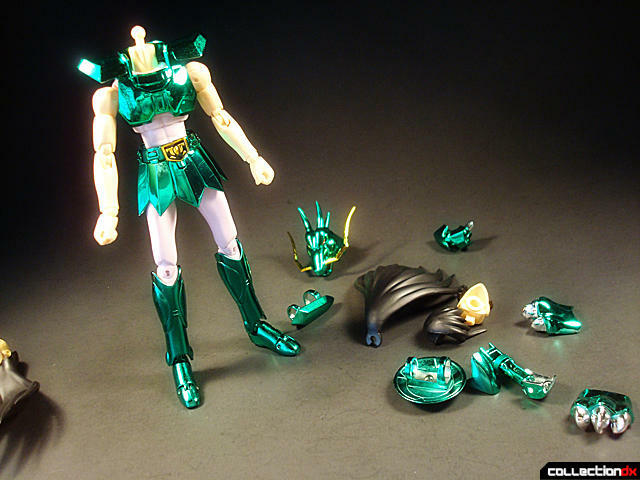 Keep in mind, as great as many of these Seiya figures can be, a couple loose joints can totally turn them from a toy to a display-only piece. Or in some cases, figures with a lot of armor attachments keep them from being playable. 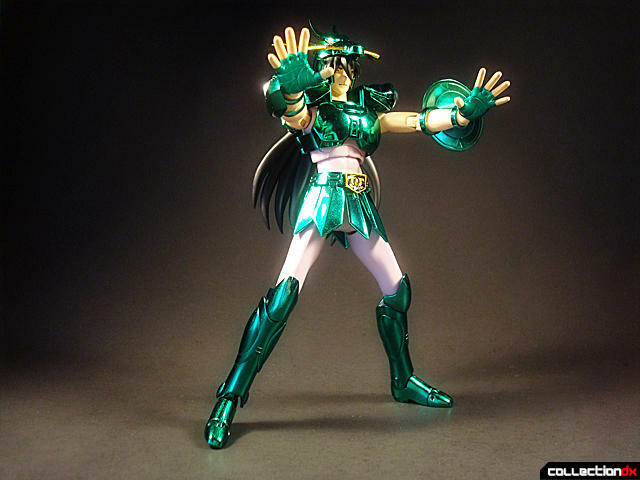 The Bronze Saints with lighter armor ( like this Shiryu) usually are much more easier to handle. So what I do most of the time is using the Seiya Display Stands with them (sold separately in batches), and also use some very tacky Super Tape (strong thin double side tape with a red film in craft store) and cut some small pieces to tape them onto the stands under the shoes. That way, I can move them around by grabbing the stand base, with the figure nicely held with no wobble or sliding around, while still very poseable (minus the legs) waist up during display. But I can always move the legs and peel the tape if I need to, or replace them when they are no longer sticky enough for the diecast weight. 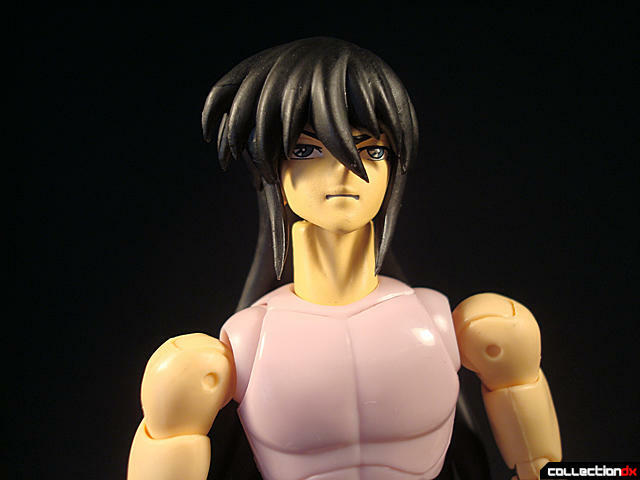 Seiya figures joints can be a bit random, especially on the earlier release with the 1st gen bodies. 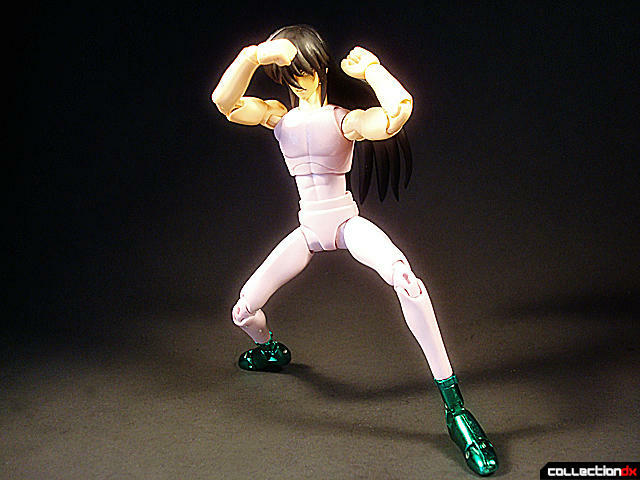 2nd & 3rd gen bodies are much improved, both on proportion and joints tightness. However, they also got rid of all the accessible screws, making it much more difficult to fix loose joints on these new bodies. All it takes is a loose ankle or a loose hip, and your figure will be unstable very easily. So having those stands are great, and even better with the Super Tape trick I use.